LiiON understands that stationary power applications require high-reliability power for long durations, and our proprietary Te-Li-Com solutions have been designed to do just that. Our products work with existing OEM power plants to provide safe, reliable power. LiiON’s groundbreaking Te-Li-Com Cabinet Series revolutionizes backup power for the telecom industry. Integrating proven and patented lithium ion battery technology within a specially designed cabinet enclosure, Te-Li-Com resolves some of the industry’s toughest challenges. The solution offers significantly higher cycle and calendar life with superior abuse tolerance compared to traditional valve regulated lead acid (VRLA) batteries — making them eco-friendly and exceptionally resilient to heat, while the lightweight, durable modular enclosure delivers far greater flexibility and protection than standard steel battery cabinets. 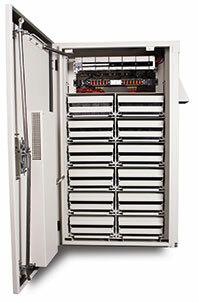 Base station products include modular 48V-100A rack mountable systems to turnkey cabinet solutions up to 1500A. Intrinsically safe designs have high cycle life, fast recharge and can be float-charged similar to lead acid batteries. Small cell backup power products are designed for compact pole- or building-mount solutions in designs ranging from 500Whr to 5000Whr. Built-in battery management and monitoring provide protection and remote monitoring capabilities.